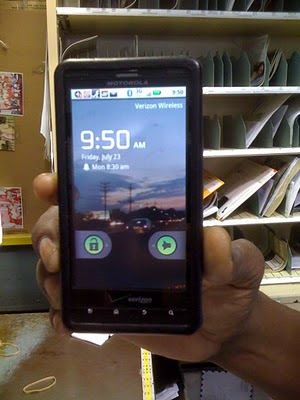 Okay, I have created a new game to celebrate this FANTASTIC DROID X Phone that I now have. With the 8mp camera, I will be taking random pictures and posting them on my Facebook page. If you are first to guess where I am, you will win a copy of the picture Or a picture of President Obama that I have taken. It will be your choice, and you will have to send your address to my inbox. It will give my photography some exposure. It will show how GOOD the Droid X is. It will keep the Post Office in business, because I gotta send you MY AUTOGRAPHED photo that I took in the mail.